HONK IF YOU DIG DOGS! We are professional canine care givers, who love what we do. We treat each client as we would like to be treated; and we treat each dog like they were our own. …is our Battle Cry! We do everything that we can do to try and make sure that each and every client (two or four legged) leaves our facility with smile, and a positive experience. We strive to be the best at what we do, and we are constantly making changes and upgrades to better service our clients. We take feedback seriously, and are always open to suggestions as far as ways that we might be better at what we do. We love what we do, and we love getting a little toot of the horn when our friends and regulars pass by. so you can see the difference for yourself! They truly are amazing here. We had never left our pups overnight at a facility and Peculiar Pet Spa goes above and beyond to make sure our pups are treated as their own. We are fortunate to have them! We just picked our dogs up from boarding here for the first time (though they've been groomed here once before), and will definitely be boarding here rather than with the vet. Here, they got daily playtime with other dogs if they wanted it, and we were texted daily with updates on our pups, and even received a couple of videos of them having fun. We highly recommend Peculiar Paw Spa for grooming and boarding. Took our dogs in today for grooming, bath and claw trim. They did a wonderful job. Even the dogs act like they know how cute they are now. Our babies just spent 6 nights here. They've been numerous times for daycare, grooming and boarding. Great place with amazing service. We are so lucky to have such a nice place for our fuzzy sweeties here in Peculiar. Thanks guys and we'll definitely be back soon! Good people, good prices, great advice with how to handle bad dehavior with your fur babies. Great Business. My wife and I will be using this location for boarding our dogs for now on because not only is the owner knowledgable, caring and good with the dogs but he goes the extra mile by always trying be accomodate his customers with pick up times and such... We definitely recommend. Everyone knows how hard it is to leave your dog when you go out of town. Well, Greg definitely makes it easier. Our Daisy was well taken care of, and even though I wasn't sure how she would do with other dogs, she obviously had a ball. We received pictures/videos every day and they showed our Daisy having lots of fun with the other dogs and getting lots of attention. I will feel much better leaving her the next time we leave town! Huge RAVE to Peculiar Paw Spa! We just returned from vacation, during which our dog Rylee stayed there 6 nights. Greg sent us almost daily text, picture and video updates of Rylee having fun and playing. This was by far the longest time we have been away from her, so that really helped set our minds at ease. They have a great facility with a lot of space for the dogs to run and play outside. We will continue to bring Rylee for occasional doggie daycare just because of the great time she had while there! We support this local business!! 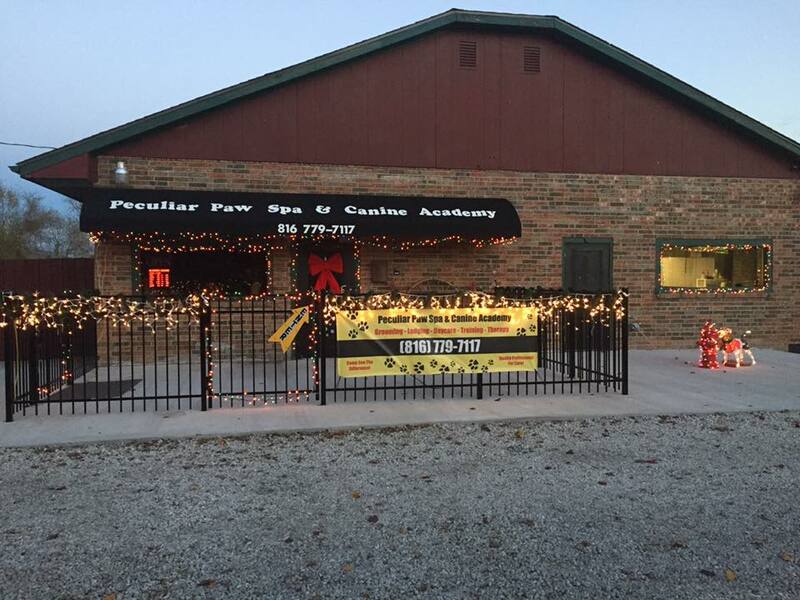 Peculiar was in need of businesses that can benifcial to the community. We have 3 small dogs. One we recently adopted was a puppy mill dog. We have taken her to Greg's staff for grooming. Not only did they do an awesome job. They were very caring and loving. We are looking forward to using Greg for day care, boarding and training! I'm very protective of my 2 fur babies I left them yesterday with Greg at Peculiar Paw Spa and he went out of his way to accommodate me and took very good care of them. I will be using them for overnights and grooming. Highly recommended!